U.S. Army Gen. John Nicholson told the Senate Armed Services Committee in February that the war in Afghanistan was at a "stalemate." Afghan President Ashraf Ghani (second right) stands with Gen. John W. Nicholson (right) during an Oct. 7 ceremony after receiving two Black Hawk helicopters donated by the U.S. government, in Kandahar Air Field, Afghanistan. Nicholson prepared for a handover ceremony in April at Leatherneck Camp in Lashkar Gah, as U.S. Marines returned to Helmand Province. Nicholson listens to Afghan President Ashraf Ghani during a joint press conference with then-Defense Secretary Ash Carter in Kabul in 2016. Gen. John W. "Mick" Nicholson settles into his wood-paneled office inside the American-led military headquarters in Kabul. It's lined with plaques, pictures and ceremonial swords. He has spent more time in Afghanistan, in various jobs, than any other senior American officer — a total of 5 1/2 years. 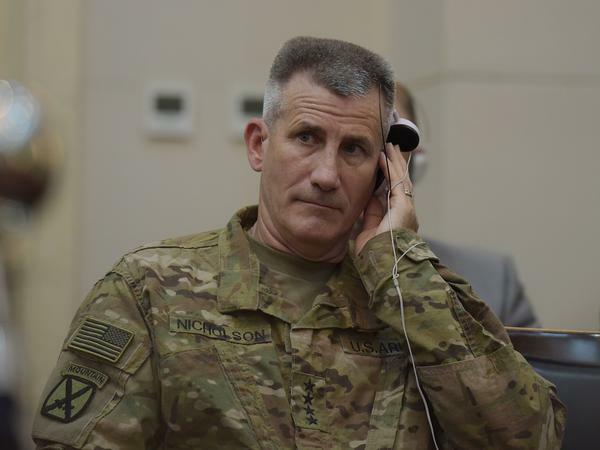 The commander of NATO's Resolute Support mission and U.S. forces in Afghanistan since March 2016, Nicholson is a genial West Point graduate with salt-and-pepper hair — and a renewed confidence. That is because the White House has given him more authority to attack the Taliban, more warplanes and drones to mount punishing airstrikes — and a few thousand more American troops to advise the Afghans. Just eight months ago, Nicholson told Congress that the Afghan fight was at a stalemate. Now, he tells NPR, "With the policy decision announced by President Trump, the Taliban can't win. It sets the conditions to get to a peaceful resolution of this conflict." But is it still a stalemate? Nicholson says, "It's still a stalemate right now. I mean the authority, the troops, the air [power] are newly arrived. I've literally gotten these in the last six weeks. But with these, we can move now in the right direction." There has been little detail in Washington about the new Trump strategy. Even senators say they've been kept in the dark. Just last week, Sen. John McCain, the Arizona Republican who chairs the Armed Services Committee, lashed out at Defense Secretary Jim Mattis and Joint Chiefs Chairman Gen. Joe Dunford. "In the six weeks since the president made his announcement, this committee and the Congress, more broadly, still does not know many of the crucial details of this strategy," McCain told the pair. "This is totally unacceptable. I repeat: This is totally unacceptable." In his interview with NPR earlier this month, Nicholson laid out some details. The general says key parts of the strategy include, over the next several years, doubling the size of the Afghan commando force — the Army's best fighters, currently numbering about 17,000 — and doubling the size of the Afghan Air Force, providing its pilots with modern American Black Hawk helicopters to replace its aging Russian ones. Maybe more importantly, the troop drawdowns and deadlines set by the Obama administration are no more. Conditions on the ground, success against the Taliban, will be the new metric as the U.S. enters the 17th year of its war in Afghanistan. Doing away with deadlines, says Nicholson, "is absolutely critical" because the Taliban can no longer just wait until the Americans leave. Also critical is what Nicholson calls the "Pakistan piece." That is shorthand for getting rid of the Taliban safe havens in Pakistan, just across the border. What is uncertain is how this will happen, though some officials in Washington suggest possible U.S. military action — likely drone strikes — against these safe havens if Pakistan doesn't move to eliminate them. Since the terrorist attacks of Sept. 11, 2001, Pakistan has ignored pleas, threats and the withholding of aid money from the U.S. to eliminate these sanctuaries, which the Taliban uses to plan and regroup. Nicholson says his efforts can't be successful as long as those safe havens exist. In fact, the U.S. Army's own counterinsurgency manual says: "The issue of sanctuaries ... cannot be ignored during planning. ... Effective COIN [counterinsurgency] operations work to eliminate all sanctuaries." "The president said no partnership can survive when one of the partners is providing safe haven to terrorists who are attacking the other," says Nicholson. But Pakistan has been providing safe haven for years, so what is different now? "Well, No. 1 that's different," Nicholson says, "is that those conversations are taking place at the highest levels of government, and I don't want to insert myself into that." Top-level officials from Washington already have met with Pakistani leaders, pressing them to end these sanctuaries. More talks are expected in the coming weeks. Nicholson is convinced that the twin effect of going after Taliban sanctuaries in Pakistan and putting military pressure on the Taliban inside Afghanistan will pay off. "With pressure on their sanctuaries outside the country, with military pressure inside the country," says Nicholson, "we believe that significant portions of the Taliban will then choose to rejoin society." But some military officers and regional experts in Washington believe that is too optimistic. The Taliban have proved resilient, have plenty of weapons and enjoy public support in the southern part of Afghanistan. In that region, the national government is not popular; sometimes seen as predatory, with Afghan police and other officials demanding money or harassing the local population; and unable to provide basic services. The Taliban either control or exert influence in about 40 percent of Afghanistan, an area that is home to about a third of the population — 11 million people. Former Deputy Secretary of State Richard Armitage recently told NPR that the U.S. should not add troops but withdraw some and focus only on what is in the U.S. national interest: going after the remnants of al-Qaida and ISIS in Afghanistan. Armitage says the U.S. has spent too much time and effort on training Afghan troops who do not necessarily support their own government, which has too often been corrupt and ineffectual. Afghanistan remains one of the poorest countries in the world. "We can train Afghan soldiers again. We can equip Afghan soldiers again," Armitage says. "But what we can't do is make the Afghan government worthy of their sacrifice. They're not willing to die for that government." Andrew Wilder, an Afghanistan expert at the U.S. Institute of Peace, has another concern: The new Trump strategy places too much emphasis on military action and not enough on diplomacy, he says. "Right now, we're focusing on inflicting pain and not offering the talks piece," says Wilder. "I'm worried that on one hand, we're putting the pressure on, and on the other hand, well, let's take the table away." Nicholson disagrees with Armitage's assessment and says the U.S. must focus both on training Afghans and going after terrorism in Afghanistan. He also disagrees with Armitage about the Afghan government, saying President Ashraf Ghani is finally tackling corruption and appointing solid military commanders. What's more, says Nicholson, internal polling by the U.S. shows that the Taliban is rejected by 87 percent of the population. One long-standing problem is that Kabul has been disconnected from local areas, particularly in the rural south. But Nicholson says that next year, for the first time, district representatives will be elected — rather than appointed — and that will finally connect the countryside to the national government. 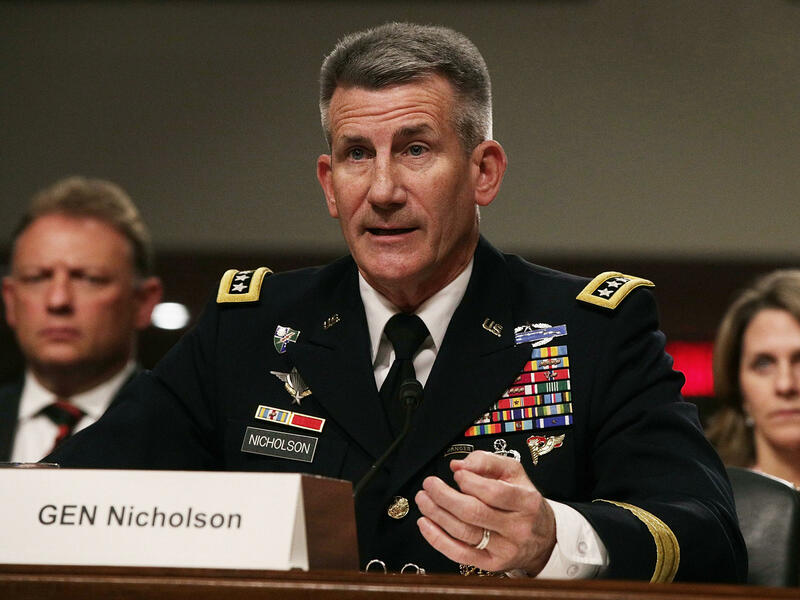 And as far as negotiating with the Taliban is concerned, Nicholson says there has been outreach to the Taliban at the local level by village and tribal elders, including multiple peace assemblies that drew thousands, including tribes with links to the Taliban. And he says Taliban fighters in Pakistan are indicating they are tired of fighting. But he acknowledges the Taliban political office in Qatar — which formally opened in 2013 for peace talks, but Trump opposes — could close. "That conversation is going on at the national level between our government and the Afghan government," the general says. "There are pros and cons to that. I'll just leave it at that." Ghani, Nicholson points out, says the Taliban office is not being used for the peace process. "It's being used for fundraising for the Taliban inside the Gulf, and again, they've not been advancing the peace process," Nicholson says. The military pressure on the Taliban is now centered on Afghan forces — with a new twist: punishing American airstrikes that have doubled over the past year. These include the use of drones, B-52 and F-16 fighter jets. And to assist in the current and future fight, the U.S. is sending another 4,000 troops to Afghanistan. The number of American troops next year in Afghanistan will increase from 11,000 to roughly 15,000. 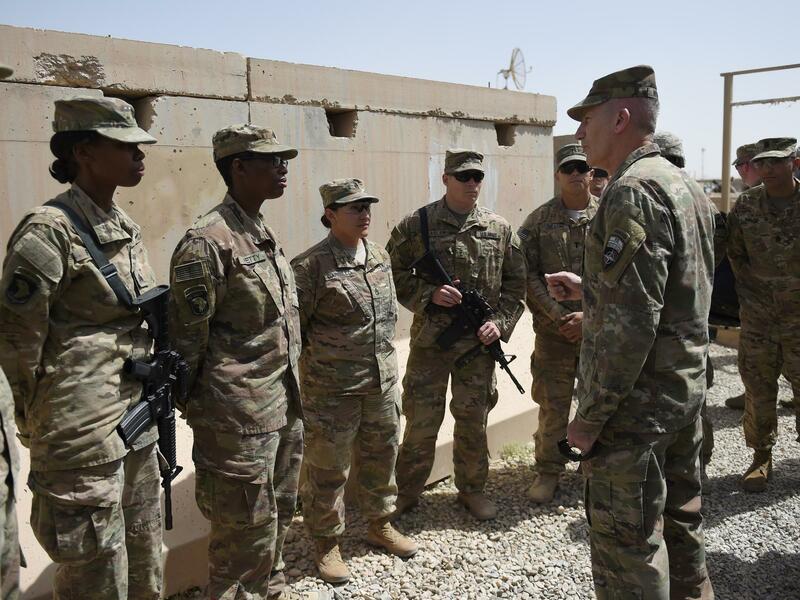 Many of them will be hand-selected because of their previous Afghan experience, and they will get extra training at Fort Benning, Ga.
Nicholson said small advisory teams will work with Afghan forces at lower levels, closer to front-line fighting. But he emphasizes that Americans are not there to fight. "We're there to advise," says Nicholson, "not to engage in combat." Still, he acknowledges that being closer to the battle — even going out on missions — could mean more American casualties. "There's no telling in the fluid battlefield. They could come in harm's way," he says. At the height of the war in 2010 and 2011, some 140,000 U.S. and NATO troops were fighting, but they could still not seal a victory against the Taliban. Nicholson has a ready explanation. "We only had 140,000 troops for a period of about 18 months in a 16-year war," he says. And — in a view shared by a number of senior officers who served in Afghanistan — the troops left too soon. "As a military commander, we drew down too far, too fast," Nicholson says. "And that led to many challenges we faced the last couple of years. We pulled off the Afghan units too soon. And now we're fixing that." Nicholson says the goal is to get Afghanistan to "a manageable level of violence." The key, he says, is not to eliminate all violence, but to bring it to a level at which it can be finally controlled by Afghan government forces. When will that level be achieved? Nicholson says it will take about five years. The United States is trying again to force the Taliban to negotiate in Afghanistan through 16 years of war - 16 years as of this month - that has been the hardest part. President Trump's new strategy for the war called for sending more troops and giving no timeline for their withdrawal. NPR's Tom Bowman was recently in Afghanistan and spent a day with the man who has to make the new strategy work. TOM BOWMAN, BYLINE: General John Nicholson sits with his fellow NATO officers and Afghan officials inside a massive aircraft hangar at a base in the northern city of Mazar-i-Sharif. It's a change of command ceremony, handing over command of the training effort here from one German general to another. Nicholson gets up to speak and sends a pointed message to insurgent fighters. JOHN NICHOLSON: The Taliban cannot win, and they have no choice but to reconcile. The good news is that reconciliation is possible because of the hard work and the sacrifice of the Afghan National Security Forces and the Afghan people. BOWMAN: Before long, Nicholson heads back to his headquarters in Kabul. He settles into his wood-paneled office lined with plaques, pictures and ceremonial swords. He spent more time in Afghanistan in various jobs than any other senior American officer, a total of five and a half years. Nicholson's a genial West Point graduate with salt-and-pepper hair and a renewed confidence. That's because the White House gave him more authority to attack the Taliban, more warplanes and drones to mount punishing airstrikes and a few thousand more American troops to advise the Afghans. Just seven months ago, Nicholson said the Afghan fight was at a stalemate. NICHOLSON: With the policy decision announced by President Trump, it sets the conditions for us to get to a peaceful resolution of this conflict. BOWMAN: Is it still a stalemate? NICHOLSON: It is a stalemate right now. I mean, the authorities, the troops, the air are newly arrived. But with these, we can now move this in the right direction. BOWMAN: The general says key parts of the plan include, over the next several years, doubling the size of the Afghan commandos, the army's best fighters, and doubling the size of the Afghan Air Force, providing its pilots with modern American helicopters to replace the aging Russian ones. Maybe more importantly, the troop drawdowns and deadlines of the Obama administration are no more. Conditions on the ground, success against the Taliban, will be the new metric. NICHOLSON: It's absolutely critical. So that plus the Pakistan piece were absolutely critical. BOWMAN: The Pakistan piece - that means getting rid of the Taliban safe havens in Pakistan just across the border. Since the 9/11 attacks, Pakistan has ignored pleas, threats and the withholding of aid money from the U.S. to eliminate these sanctuaries, which the Taliban uses to plan and regroup. Nicholson says he can't be successful while those safe havens exist. BOWMAN: But they've been providing safe haven for years and years and years. What's different? NICHOLSON: Well, number one that's different is that those conversations are going to occur at the highest level of government. And I don't want to insert myself into that. BOWMAN: Nicholson is convinced that cutting off those sanctuaries and putting more military pressure on the Taliban in Afghanistan will force the Taliban to the bargaining table. But some military officers and regional experts in Washington think that's too optimistic. The Taliban have proved resilient, have plenty of weapons and enjoy public support, particularly, in the southern part of the country. The Afghanistan national government is not popular out in the provinces, is riddled with corruption, consumed with infighting and at times predatory. Nicholson says the Afghan government is now making important changes, appointing more competent military commanders and prosecuting corruption cases. And for the first time, next year, Afghans will go to the polls and elect district representatives who up to now have been appointed. NICHOLSON: This is significant because this is the first time that we'll have representative government at the local level connecting with representative government at the national level. 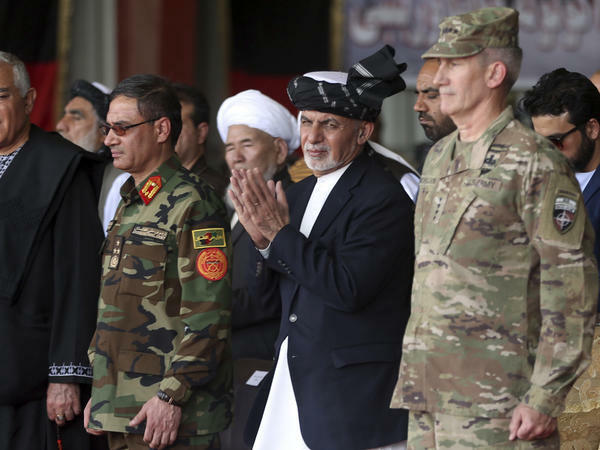 BOWMAN: Andrew Wilder, an Afghan expert at the U.S. Institute of Peace, has another concern. The new Trump strategy places too much emphasis on military action against the Taliban and not enough on diplomacy. ANDREW WILDER: Right now, we're focusing on the - inflicting pain and not offering the talks piece. I'm worried that on one hand, we're putting the pressure on and the other hand, saying, well, let's take the table away. BOWMAN: Nicholson says there's some outreach to the Taliban at the local level, but he acknowledges the Taliban political office in Qatar, opened in 2013 for peace talks, could close. NICHOLSON: That conversation is going on at the national level between our government and the Afghan government. There's pros and cons to that, but I'll just leave it at that. BOWMAN: Afghan President Ashraf Ghani, Nicholson points out, says the Taliban office is not being used for the peace process. NICHOLSON: It's being used for fundraising for the Taliban inside the Gulf and that they've been - again have been not been materially advancing the peace process. BOWMAN: So military pressure on the Taliban is clearly the central part of the new strategy. And the fight is now being led by the Afghan military, supported by American airstrikes that have doubled over the last year. And to assist in the current and future fight, the U.S. is sending another 4,000 troops to Afghanistan. Nicholson said small teams will help Afghan forces down to a lower level, closer to frontline fighting. NICHOLSON: We are there to advise. We're not there to engage in combat. BOWMAN: Still, he acknowledges that being closer to the battle - even going out on missions - could mean more American casualties. NICHOLSON: There's no telling - that could end up - you know, in the fluid battlefield we face, they could come in harm's way. BOWMAN: The number of American troops next year in Afghanistan will increase from 11,000 to roughly 15,000. At the height of the war, some 140,000 U.S. and NATO troops were fighting, and they could still not seal a victory against the Taliban. General Nicholson has a ready answer. NICHOLSON: We only had 140,000 troops for a period of about 18 months out of a 16-year war. BOWMAN: And the troops left too soon, a view held by a number of senior officers who served in Afghanistan. NICHOLSON: I'll tell you, as a military commander, I think we drew down too far, too fast. And that's what led to some of the challenges we've faced the last couple of years. We pulled off the Afghan units too soon, and now we're fixing that. BOWMAN: General Nicholson says the goal is to get Afghanistan to quote, "a manageable level of violence." NICHOLSON: The key here is not to eliminate all violence. It's to simply get it to a level that can be controlled by the government forces. BOWMAN: When will that level be achieved? General Nicholson predicts about five years. (SOUNDBITE OF TYCHO'S "COASTAL BRAKE (MANUAL MIX)") Transcript provided by NPR, Copyright NPR.